Amish Wagon Works: The Kettler Kettcar Kabrio! The Kettler Kettcar Kabrio (try saying that five times in a row!) is a multi-colored pedal car that is sure to start a neighborhood trend! This German-made toy is built with chain-driven steering and is freewheeling for coasting, and has an easy-to-reach handbrake for safety and control. What kid wouldn't want to ride on this! This Kettcar pedal-car is powder-coated for increased durability, and the wheel treads are designed with safety foremost. 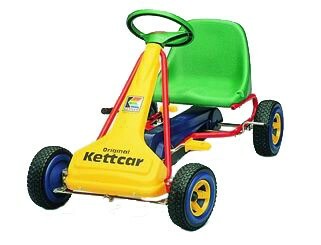 Get your young racer a Kettcar today!